Stealthy Mom: Go Sweatshop Free! Sweatshops are in the news again, following a recent tragedy where over a thousand Bangladeshi garment workers (and counting) were killed in a building collapse. Despite the evacuation order by local police, thousands of people clocked in after management threatened to withhold their monthly pay, an average of sixty-three dollars including lots of overtime. How did we get to this point, where a worker has to risk her life for sixty-three dollars? As consumers, we can choose whether or not to participate in a system where "the lowest price is the law," whatever the cost to other people and to the planet. Most apparel companies have a blanket statement about not knowingly buying the fruits of slavery or unsafe sweatshops; complicated supply chains and subcontracting makes it difficult to tell where their wares actually came from. Retail price is not an indicator, either, since the factory collapse last month involved some pricey labels, as did deadly factory fires in November and September. Garment by garment, we have been making an effort to cut off our support for exploitation and to support companies that do business honourably. That change was not an easy one, but I can tell you that a shirt made from slavery-free materials and sewn by workers who earned a decent living feels good on. I shop for organic products when possible because pesticides are bad for the earth, the farmworkers, and the factory workers. Shop Used. This is the most cost-effective way to get new threads without feeding the machine. I love to donate outgrown and rarely worn items to the thrift shop store and pick up a few things on my way out. Sometimes I will buy something really crazy, wear it a couple of times, and donate it back again. Local swap shops, garage sales and eBay can be sources for great finds, too. Twice I have gotten new Birkenstocks for under thirty bucks because someone else bought them, changed their minds and put them for sale online. Trade. Some communities have organized exchanges, often for kids' clothing. Take in a bag of 2Ts, come home with 3T's.... If your kids are into sports, look for equipment trades. Make Your Own. Well, not me. The last garment I made myself was a toga, and that was over a decade ago. For those of you with talent, I commend you. Find a Great Seamstress. Having someone alter a thrift-shop find or to create custom garb can cost a fraction of shopping off-the-rack, especially with formal wear. Supporting a local artisan gets bonus points! SOS From Texas grows certified organic cotton to be made into tees, night shirts, baby onesies, bags, socks, and fabric by the yard. The tees we have received so far were well made and had an old-fashioned feel that softened with washes and wear. These are sturdy, basic tees that are available in many colours. The mens' tees run a bit small, so ordering a size up is a good idea. SOS offers custom manufacturing and printing. bgreen apparel makes organic cotton knit tees, sleepwear, pants and intimates for ladies and men. Some of their materials are domestic and some are imported. I am wearing a pair of their yoga pants right now. I bought Stealthy Dad a henley, sweats and some boxer-briefs, and they all were well made and the fabrics have a nice feel. In Canada, you can find bgreen apparel at the Organic Apparel Shop. Fed by Threads makes mens, ladies, and baby clothing in USA from organic cotton, hemp, and recycled materials. They also offer custom printing. For each garment sold, Fed by Threads donates enough to local (Southern Arizona) and national food banks to provide twelve meals to hungry people. Earth Creations are really fun. 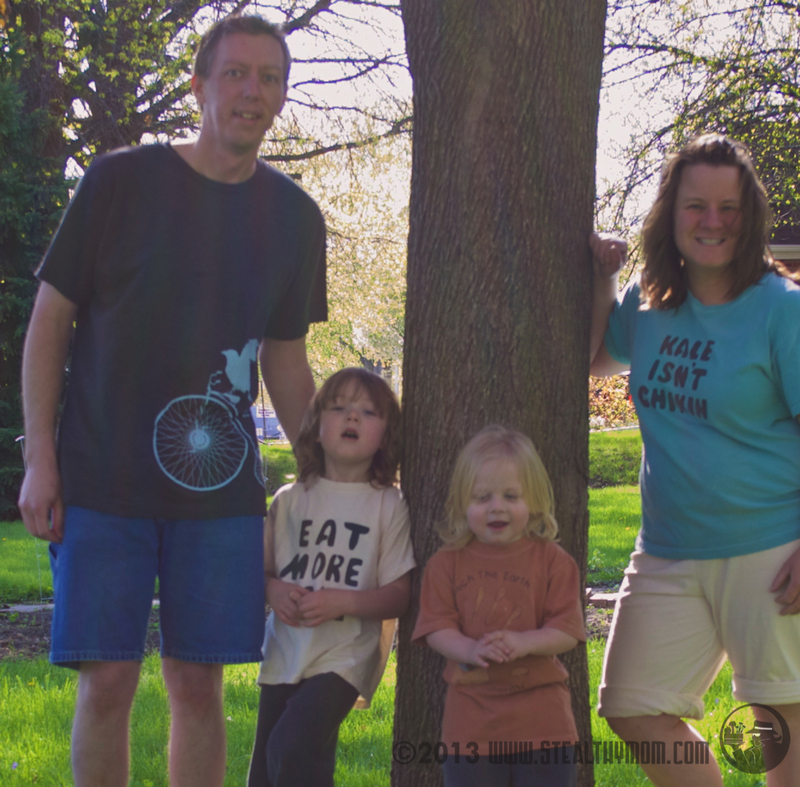 They make organic cotton tees for men and kids that are dyed with clay. "Dirt Shirts," they call them. For women, they make funky organic cotton and hemp dresses, tees, pants and skirts. Most of their garments are sewn in Alabama, while some are sewn (fair-trade) in Nicaragua with USA cotton then dyed in the USA. My favourite piece is an organic hemp/cotton blend tunic that I wear as a dress because I'm short and can get away with it. The hemp/cotton fabric feels and drapes like raw silk but is washable and durable. The boys and their dad have clay-dyed tees with eco-friendly designs on them. green 3 apparel makes mens' sweaters and tees, and ladies' tees, skirts, dresses and pants from organic, reclaimed and recycled materials. Most of the garments are organic cotton, and all are produced domestically. Their t-shirt designs feature rural-inspired slogans promoting local agriculture and nature. (It is ironic to me that their brick-and-mortar store is in Oshkosh Wisconsin, since the famous label named for that city is now made overseas in sweatshops.) You can also find green3 at the Fair Indigo store. Cotton of the Carolinas makes tees, "dirt-to-shirt" in North Carolina. Mostly a wholesale and private label business, they do have some designs for retail. Some are organic, some are not, and all are made domestically. Each garment with the Cotton of Carolinas label has a code for the wearer to look up every member of the supply chain. Me to We Style is a Toronto company that makes tees, polos, sweats, yoga pants, and dresses from certified fair trade organic cotton and bamboo. They stock interesting designs on tees and sweatshirts and offer custom screen printing. Half of their annual profits are donated to Free the Children, an international organization that helps children through education. Teres Kids makes cotton knit clothing for kids from USA-grown, organic cotton. I love browsing the site because of all the colourful duds. Kiwi Industries makes clothing for babies and preschoolers from organic cotton, sewn in the USA or knitted by a co-operative in South America. If you've been looking for a sweater with a Sesame Street character in the knit, you might find it here. They also have karate pants, jumpers, hats and mittens. Cottonfield USA makes organic cotton apparel for men and women. They are very transparent about the suppliers of their fabrics, which are grown in USA. While they sell tees and such, Cottonfield is most known for their unbleached, latex-free cotton intimate apparel. Blue Canoe makes ladies' dresses, tees, and active wear in California from organic cotton and bamboo. You will find their bras for sale at many retail outlets. Kasper Organics carries many USA-made and fair trade brands of organic cotton and hemp clothing for men, women, and kids. Brands they carry include SOS from Texas, Cottonfield USA, Maggie's, and Blue Canoe. While each of these companies does have its own online store, shopping with Kasper's will let you put it all in one basket to save on shipping. Buy Fair Trade Products. People in other countries have to eat too, right? While most retailers hide behind convoluted supply chains, there are a few that make an effort to ensure that the people who make their wares earn a decent living at a safe workplace. Fair Indigo retails USA-made mens' and ladies' clothing from green 3 apparel, and internationally, fairly made labels including Neon Buddha and Ethos Paris. Their own Fair Indigo Collection are dresses, skirts and tees made fairly in Peru from organic pima cotton. They also sell baby gear from Joobles and Lulu La. Mata Traders designs and imports fashions and jewelry made by women's co-ops in India and Nepal. Unlike most garment factories, these co-ops provide benefits like child care, overtime pay, annual medical check-ups and community development programs. Many of their dresses and skirts are inspired by 1950's silhouettes, with traditional block prints and modern colours. Neat-o! Soul Flower retails mens', ladies' and children's' wear made with organic cotton, hemp, and recycled materials. Some of their fashions are made in the USA, and the rest is imported with fair trade. If you love tie-dyes, daisy prints, patches, and peace signs, the Mother Ship is calling you home. There are some more conservative polos and button-down shirts for men, though I would love to see if Stealthy Dad could get away with their comfy-looking hemp pants at the office. Autonomie Project sells Ethletic brand shoes including canvas sneakers, flip flops and rain boots. The natural rubber for the soles and boots is sustainably harvested and fairly traded. They also sell fair-trade tees and some tees made in USA, all in organic cotton. Maggies Organics makes organic cotton socks in North Carolina using cotton from fair-trade cooperatives in Nicaragua. We have a few pair of crew socks that are soft and cushy. They also offer organic cotton tanks, nighties and tees that are made fair-trade in South America. Threads 4 Thought makes clothing from organic and recycled materials, for men and women. Many garments are made in USA, and the rest are imported from factories that treat workers fairly. A portion of every purchase goes to the International Rescue Committee. Stealthy Dad has a couple T4T polos. Their recycled fabric has a unique, lightweight texture. While this list is not exhaustive, I hope you had fun browsing a virtual mall filled with earth-and-people-friendly fashions. Did I miss any of your favourites? Please share, since we are all in this together. Searching for home tips, recipes, or other good ideas? Visit Wildcrafting Wednesday, Simple Lives Thursday, Small Footprint Friday, the Homestead Barn Hop the Hearth and Soul Hop and Foodie Friends Friday Linky Party. Sometimes I find a real treat at a thrift shop or on EBay: I have a Dooney bag that is old enough to be made in USA, and it only cost me $12! Ten years ago, jeans brands like Levis, Guess and Lucky were still made clothing here, and Silvers were still made in Canada. As for the sweatshop second-hands, I figure the deed is done. One more person taking a turn wearing them won't hurt anyone. Great resource list - book marking for future reference! I wish I'd had this list back when I was writing my blog post about reducing your slavery footprint a couple months ago. Thanks again! This is great. Amy, would you care to leave a link here to your article, too? I'm sure you have some great ideas. Great list! Thanks for linking up at Wildcrafting Wednesday! Great information and a great reference source as well. Thanks for sharing this on the Foodie Friends Friday Link up party. Things are changing in Bangladesh. Sure hope they do! Folks there have to eat, too, right? Fair trade certified is a good start, but generally applies to smaller companies and workshops. It would amazing to see some labour standards applied and enforced. Thank you for this article! I would love to look into this more. Do you have a list of your sources that you could give to us?